Allergies are a nuisance, and sometimes life-threatening. Dr. Ahmadur Rahman, MD, a leading internist located in the Union Square neighborhood of New York City, is an expert in allergy testing and treatment, effectively alleviating a wide-range of symptoms for patients throughout the greater New York City metro area. Allergic reactions start in the immune system. The immune system’s purpose is to fight off harmful substances that can cause illness. An allergic reaction occurs when the immune system mistakes an otherwise benign substance, called an allergen, for a dangerous invader. In doing so, it produces antibodies leading to the release of certain chemicals that cause an allergic reaction, such as; sneezing, coughing or skin irritations. Allergies can also cause chronic conditions like sinusitis and asthma. Foods are the most common allergens among young children, and often these allergies are outgrown. The most prevalent food allergies are; eggs, nuts, milk, soy, wheat and fish. Latex; used in gloves, balloons, and condoms. Insect stings, from bees, wasps, yellow jackets, hornets, and fire ants. Drugs, most commonly penicillin and other antibiotics. Two tests are commonly used. Dr. Ahmadur begins with the prick or puncture test, as it is the least invasive and is usually effective. This test involves pricking or puncturing the patient on the skin’s surface with a diluted version of the suspected allergen. The site is then observed for approximately 15 minutes. If the patient is allergic to the tested substance, an itchy, raised, red bump will appear. The larger this reaction, the more acute the patient’s allergy. If the result is negative, Dr. Ahmadur will follow up with an intradermal test, can offer more detail. An intradermal tests involves injecting the diluted allergen below the skin surface with a very thin needle, and again, waiting to observe whether there is a reaction. 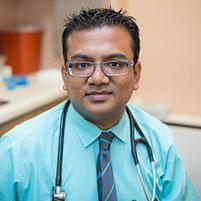 How does Dr. Ahmadur treat allergies? The type and severity of each patient’s allergy will determine the specific treatment. However, the most effective approach is always to avoid the allergen whenever possible. Dr. Ahmadur also prescribes medication or recommends over-the-counter remedies to alleviate symptoms. To cure an allergy, he may advise immunotherapy (allergy shots). This entails undergoing weekly or bi-weekly injections of the allergen. The strength of the injections is gradually increased, which works to decrease the individual’s sensitivity and eventually his or her allergic reaction to the substance.